Confessions of the Pricing Man - Why Read this Pricing Strategy Book? Who Should Read Confessions of the Pricing Man: Anyone who makes decisions and sets prices in your company. Confessions of the Pricing Man gets you thinking about pricing from a strategic perspective. It shows you how to set pricing, provides interesting and unique examples and gives you a deeper understanding of “how price affects everything”. Simon explains clearly the impact of pricing decisions and provides you with a toolkit of workable tables that you can transfer into Excel spreadsheets and use within your business. These tables make it easy to see the value of your pricing decisions. 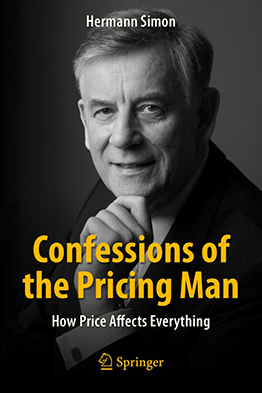 In my opinion, Confessions of the Pricing Man breaks down the difficult task of pricing into a simple process. The cleverness of this book is in its simplicity. Hermann Simon explains the benefits of strategic pricing clearly and gives you the tools to implement a winning pricing strategy.